This summer, the German city of Karlsruhe is staging a series of installations around town that are themed around a surprising topic: Construction work. The series is called The City Is a Star, and it focuses on “machines and materials of construction work,” as Designboom points out today. Karlsruhe—and its local ZKM Center for Art and Media—asked four artists to install art that relates to construction work around the city, including work by Hans Hollein and Tim Otto Roth. But two of the artists took the theme very literally. Austrian artist Erwin Wurm, whose piece, Truck, is literally a truck parked on a city street in Karlsruhe. Of course, he body of the cargo hold curves upward, making it look as though it’s been stretched by some giant. Last week, the piece attracted a ton of attention online when outlets reported that some stuffy police officer had issued the truck a very real parking ticket (it was a fake joke ticket, the city later explained). 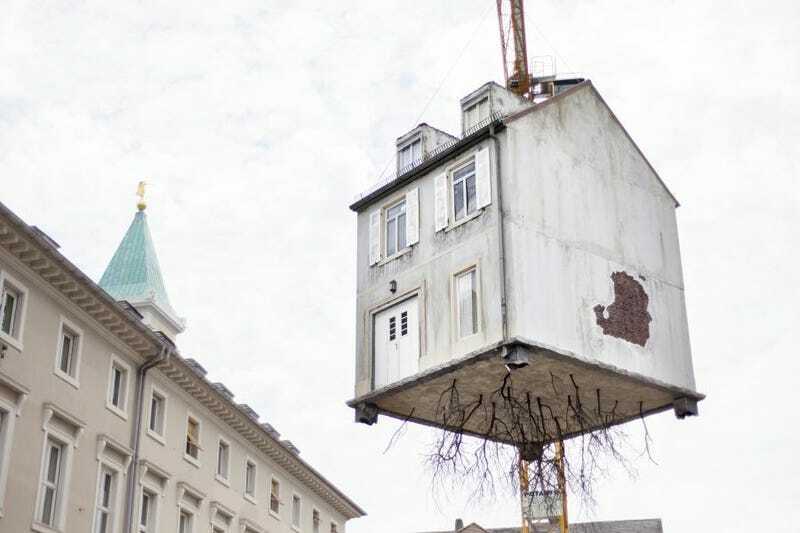 In Karlsruhe, Erlich has installed a piece called Pulled By the Roots, a “house” that dangles from an actual construction crane in an actual construction site in the city center. It looks just real enough to trick the eye—until you notice the “roots” dangling off of the home’s foundation. The structure is designed to look as though it belongs to a nearby group of row houses, adding to the effect. It’s an obvious ruse as soon as you see the roots, of course. It’s more fun to imagine someone on their way through the city, maybe late for work, seeing a house dangling from a crane out of the corner of their eye—and managing not to notice the difference. All images via ZKM Karlsruhe.